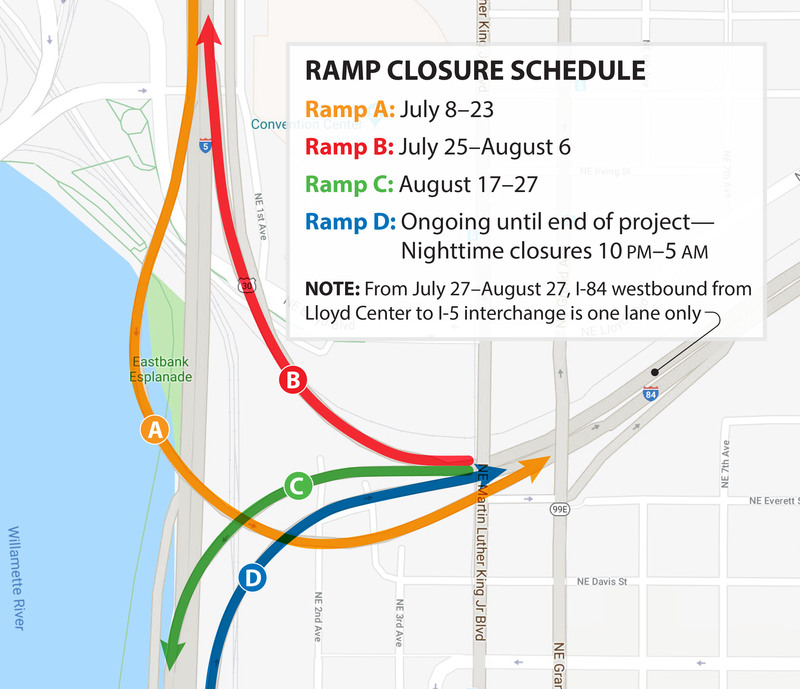 Let TriMet’s MAX Light Rail system roll you past the traffic jams and expected delays when I-84 ramps to I-5 close beginning Wednesday, July 25 as Oregon Department of Transportation (ODOT) continues work to improve the I-5/I-84 interchange. We have free Park & Rides where you can park your car and easily connect wit h trains. MAX Blue, Green and Red lines—which run parallel to I-84 between I-205 and I-5—are your best option around the upcoming I-84 ramp and lane closures. 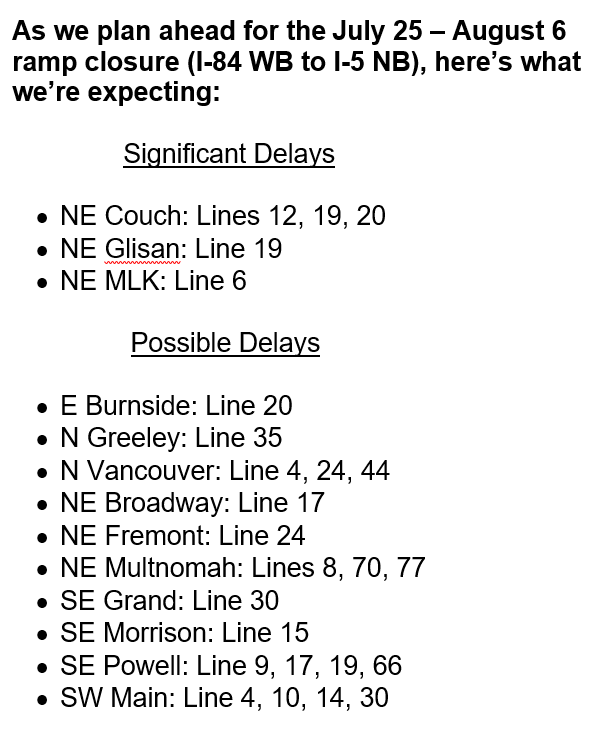 ODOT expects these closures will cause much more traffic congestion than the I-5 ramp closure that began July 8, warning it could take up to three hours to travel from I-205 to I-5 along westbound I-84. Avoid the traffic bottleneck expected by parking your car and taking MAX. 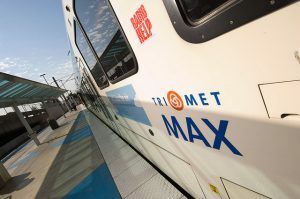 TriMet has a number of Park & Rides on the MAX Blue Line east of the Gateway/NE 99th Ave Transit Center and on the MAX Green Line south of Gateway. MAX Red Line runs between Portland International Airport and Downtown Po rtland, and serves two Park & Rides; however, these lots tend to fill early. Click here to view a map of Park & Ride locations. Also visit trimet.org/parkandride to find information about Park & Ride locations, including spaces and use. Whether using a TriMet Park & Ride or any public parking lot, be sure to lock your car and stow all personal items out of sight. Experts suggest leaving your car “showroom” clean inside – as if you just drove it off the showroom floor at the car dealer. TriMet’s MAX lines connect with multiple bus lines at transit centers and in Downtown Portland, to help you reach destinations not near MAX stations. Our online Trip Planner makes it easy to plan a trip, with information on travel and walk times, transfers and cost. Need more help? Our Rider Support team is available seven days a week, between 7:30 a.m. and 5:30 p.m. Call 503-238-RIDE (7433), tweet to @trimethelp or use our online form at trimet.org/contact/customerservice. We do expect the closure that starts July 25 to affect TriMet buses on the inner east side, especially our lines 12, 19 and 20. 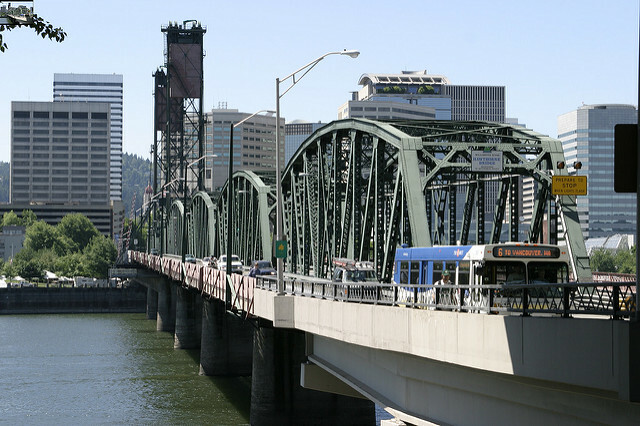 We’re anticipating significant delays approaching the Burnside Bridge, so we’ve worked with the City of Portland to turn NE Davis between SE Sandy and SE Martin Luther King Jr Blvd into bus and local access only on July 26-27, July 30-31, August 1-3, and August 20-24 from 6-11 a.m. This should help keep Line 12, 19 and 20 buses moving. We’ve also worked to restrict parking for additional hours on SE Morrison between SE 12th and SE 6th Ave and SE Madison between SE 10th and SE 6th. This will allow our buses to use the BUS ONLY lanes for longer as they approach the Morrison and Hawthorne bridges. 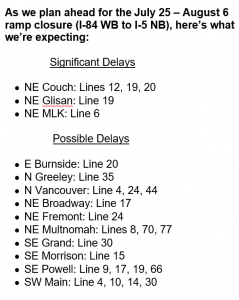 Plan ahead and plan extra time for trips in case buses become delayed. Our transportation crews will be monitoring the traffic congestion and will make adjustments as necessary. Always remember to check trimet.org/alerts before riding. While bus trips may take longer, the more people who leave their cars at home and choose transit during the project, the less congestion we’ll see on the roads. Remember, fares are required on all TriMet trains and buses. Pay your fare with your phone. Just tap the phone tied to a mobile wallet (Apple Pay, Google Pay or Samsung Pay) against the green Hop reader on our buses or at rail stations. Confirm the purchase and go. You can only pay the adult fare, but it’s a convenient option for those who only ride occasionally. Learn more. Frequent TriMet riders should opt for a Hop card purchased at hundreds of local retailers. Load it up with value then tap and go. Plus, earn day and month passes as you ride! Learn more. Go virtual with an Android device. Buy a virtual Hop card at Google Play store and load it into Google Pay. Tap the phone to a reader and get all the benefits of a plastic hop card. Learn more about fares at trimet.org/fares.